Thomas Hardy is the master of the missed moment. If one were to make a pie chart of the plot elements of a novel such as The Mayor of Casterbridge the sum of the parts would be infinitely greater than the whole. Essentially The Mayor of Casterbridge turns on one crucial moment where Michael Henchard in a fit of drunken pique auctions his wife (Susan) and daughter (Elizabeth-Jane) off to a sailor in a bar at a fair. As a result Henchard resolves not to drink again for as many years old as he is (21) and we return to his story 18 years later when he is the Mayor of Casterbridge, and a successful business man. Susan and Elizabeth-Jane return to Casterbridge after the death at sea of the sailor who bought them and has husbanded and parented them since that moment. What follows is a tangled web of events where Henchard ‘marries’ Susan, after breaking off the engagement he had with a younger woman Lucette Le Sueur. At the same time Henchard takes into his employ Donald Farfrae who develops an attachment to Elizabeth-Jane. He makes an enemy of the man he had promised the job to, Joshua Jopp and his business starts to decline, Susan dies, Lucette returns, Henchard’s sobriety ends and the ensuing events would be a soap opera in the hands of just about any other writer. When you start to read a Hardy novel, you do so in full knowledge that most of the characters will be left unhappy and full of regret, if they are alive, by the last page. However his work is not maudlin or sentimental and one of the main reasons his work never descends to this is his pithy, reportage style of writing. His descriptive passages are taut and real, the landscape comes alive around you as do the multitude of minor characters who colour the landscape. The plot while complicated and full of twists is, at its most essential, the tale of a flawed man trying to redeem himself for one glaring mistake and getting caught in the net woven from the smaller ones he makes in the process. Having read a number of Hardy’s novels and short stories I knew what I was getting in to. 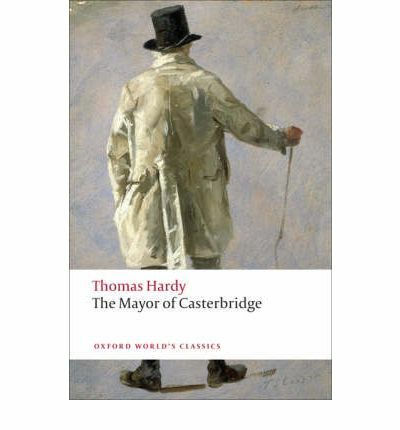 However, although Casterbridge is regarded by some critics as Hardy’s greatest novel it was not, for me, his most appealing or moving. This could be for a number of reasons. Firstly the protagonist, Henchard, is not an overly sympathetic character. He is arrogant, argumentative and cold. And in addition I found the women characters quite weak, especially Elizabeth-Jane who was downright insipid. Maybe I’m just geared to the higher levels of injustice and melodrama in Tess of the d’Urbervilles and Far From the Madding Crowd. However, it justifiably earns its place on the list, along with most of his other character based work. Hardy is a writer, reporter, anthropologist, moralist and psychologist rolled into one and as a result, quite a worthwhile person to spend several hours of your time with.